There’s nothing more warming than a bowl of comforting gnocchi. However, the uncomfortable fullness afterwards can be a bit off-putting. This version is lovely and light – perfect to serve with your favourite pasta sauce (and, preferably, lots of leafy greens to make this a “better for you” option). For the gnocchi, preheat the oven to 190°C. Place the pumpkin in a roasting dish and drizzle with the 45ml (3 tbsp) oil, dried and fresh herbs, and season well to taste. Place in the oven to roast, about 45 minutes – 1 hour, until soft. Allow to cool slightly, then place the pumpkin in a blender and blitz until smooth. Add the cream cheese and egg, and blitz until well combined. Add the 50g ground almonds, the psyllium husk powder and a good pinch salt. Blitz to incorporate. Remove the mixture from the blender (it should be a soft dough) and form into a ball. Wrap in cling film and refrigerate, 45 minutes. 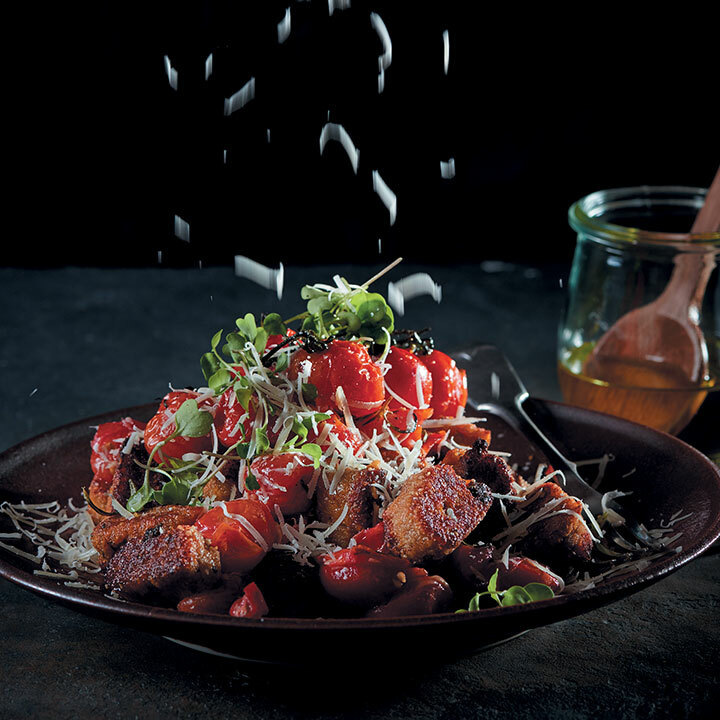 While the gnocchi cools, make the crushed tomato sauce by adding a drizzle oil to a frying pan over high heat. Add the halved baby tomatoes and fry, tossing occasionally, 4 minutes. Add the thyme leaves and fry, a further minute or so. Remove from heat and add the red pesto, then gently crush the tomato halves, using a fork. Set aside. Take the gnocchi dough out of the fridge and divide in 2. Using some extra ground almonds to aid rolling, roll one half of the gnocchi into a long cylinder of about 2cm thickness. Using a sharp knife, cut off about 1cm-thick pieces of gnocchi, then do the same with the other half of dough until it has all been cut up into little pieces of gnocchi. Add a big glug olive/canola oil to a pan over medium heat and fry the gnocchi pieces in small batches, turning after 2 minutes per side, until all of the gnocchi pieces are fried. To serve, warm the tomatoes in a pan or the microwave, add your gnocchi and toss it through. Season well, grate over a little Parmesan and garnish with microherbs, if desired.